Often the question comes up whether I really do not wear any underwear under a pair of cycling trousers, that is to say no briefs? That is correct and we also recommend that. Since not wearing underwear results in the least friction and there will be no disturbing seams or fabric bulges in the seating area. seat pads for cycling shorts nowadays is equipped with antibacterial materials straight from the factory. Good seat cushioning is anatomically designed for the sexes, cushionings for women distinguish themselves from thoses for men. It is of course completely up to you whether you would like to wear an additonal thermal layer underneath your trousers. We also offer those to you as part of a great selection of (bike underwear). 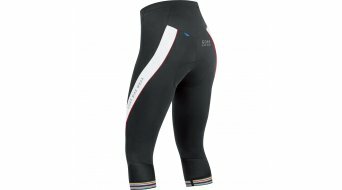 They are a good addition especially in winter and at cycling tours at cold temperatures in order to protect the lower back and the genital area from the cold and keep them warm. Do the bike bibs fit correctly? It certainly is not always an easy task, the purchase of a new pair of cycling shorts. Here, several arguments muss fit together. You should not try on the shorts only standing, that is something that is all too often forgotten! Because you will need it for sitting on your bike. If you try it on, you should also test the sitting position when bent-over, leaning forward on a chair or stool. There may not be any disturbances by superfluous fabric in the crotch and the belly-thigh-angle. The same applies to mid-length and long cycling pants in the area of the knee bend. Not seldom, you must go through several different manufacturers of cycling bibs until finally, you'll find the right bike shorts for yourself. But it is worth the efforts, you'll be thankful to have found the right shorts when you're on your next cycling tour. Most cycling trousers nowadays can be machine-washed at low temperatures without any problems. But you should at least use a laundry net for that purpose in order protect the padding and the fabric of the shorts and to treat same with care. Occasionally, a hygiene rinse in the machine can't do any harm and this way, bacteria is reliably removed in spite of the low temperature during the actual washing. In a perfect case, you'll use special detergent for functional clothing when washing sports wear. Our extensive article on "care instructions", care of sportswear will also help you with tips. After all, a highly functional pair of cycling shorts nowadays consists of more than just cotton. Our textile dictionary will be better in explaining the different materials which are being used in terms of sportswear.